Far Infrared saunas (130-140 degrees) are safer and different from regular hotter saunas (200-225 degrees) by increasing your internal body temperature and penetrating deeper in the muscle instead of just heating your skin. These wave lengths provide healing energies. We are living in a toxic world and the Far Infrared helps to detox. Toxins are acidic and make the body acidic and more susceptible to illness. Detoxing helps the body become alkaline which resists illness and cancer! The infrared energy released by our infrared sauna can penetrate up to 1.5 inches into muscle tissue which can reduce muscle spasms, joint stiffness, aches and pain due to chronic conditions of Fibromyalgia, Osteoarthritis and Rheumatoid Arthritis. The deep penetration of the infrared rays increases the body’s core temperature up to 3 degrees which results in a deep detoxifying sweat at the cellular level. This will remove toxins stored in the fat cells thus there is a thinning of the fat cells!! It can help reduce potential carcinogenic heavy metals such as mercury and lead, as well as alcohol, nicotine, uric acid (gout), sodium and cholesterol. The sweating in this sauna can burn 600 calories according to information published in the Journal of the American Medical Association. This is like running 2-3 miles. 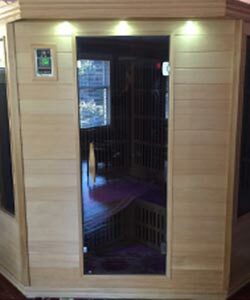 The infrared sauna increases heart rate, cardiac output and metabolic rate leading to weight loss. Collagen production is stimulated by far infrared rays which may improve tone, texture, elasticity and firmness of the skin. It also increases blood circulation to the skin which brings fresh nutrients. Infrared therapy can help stimulate the body’s immune system by elevating body temperature. Many viruses, bacteria and tumor cells are thought to have poor tolerance to heat. 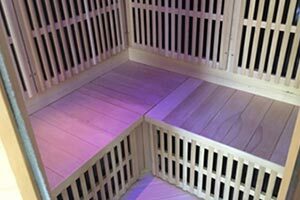 This infrared sauna can cause a 3 degree increase in body temperature shown to stimulate white blood cells which may improve your body’s immune system. Infrared sauna therapy help the body maintain healthy levels of cortisol which will drop immediately after your session. High levels of cortisol are related to increase stress and deposit of excess fat cells in the midsection. Improve the health and fitness of our clients through education of our staff and clients. We will treat you with honesty and integrity and provide exceptional customer service.